Pemberton & District is your gateway to adventure. Blackcomb Helicopters is a full-service, multi-fleet aviation company with aircraft charters and aircraft maintenance services in rotary wing and fixed wing divisions that offers a variety of rides and experiences. Dreamcatcher Meadows is an international champion horse breeding and training farm also offering large group tours, venue rental of riverside custom built wedding and corporate entertainment facilities. Located just north of Whistler and a short 2.5-hour drive from Vancouver, Pemberton & District is your gateway to adventure. Tourism Pemberton is an independent not-for-profit destination marketing organization dedicated to promoting tourism and travel for Pemberton, BC and the surrounding region. Whether you’re looking for the best B&B or campground in the area, or deciding on which fun activities to do during your summer vacation, our site is your one-stop shop for everything you need to know about Pemberton! About: A chance to share, connect, re-connect and learn! 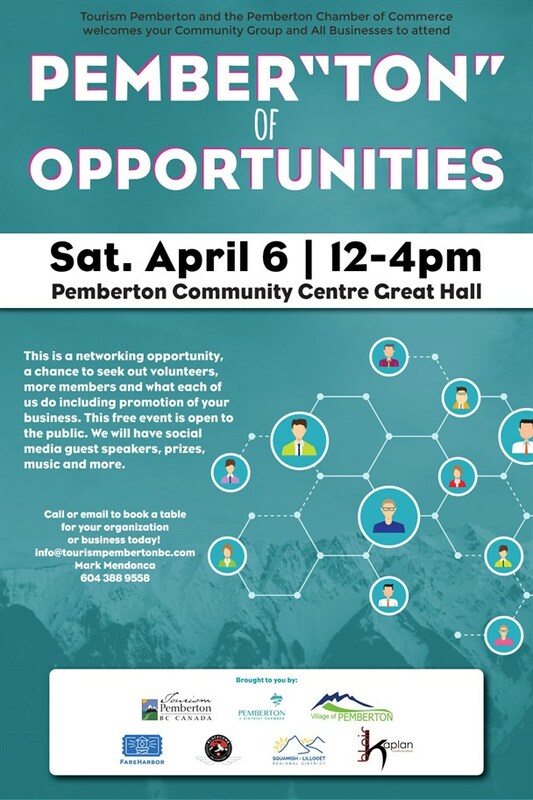 Pember’TON’ of Opportunities is free to attend and open to the public. There will be a social media guest speaker, prizes, music and much more! Explore the official FREE Tourism Pemberton App featuring a community event calendar, business listings, things to do and more!